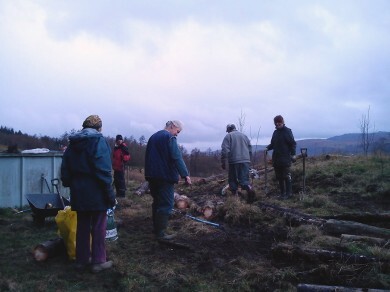 Many thanks to the hardy locals who joined us to plant some new trees yesterday - 24 x cherry plums (Prunus cerasifera) at the rear of the Paddies, and 6 silver birches (Betula pendula) at the foot of the Meadow, to counteract the exposure caused by Brantwood's recent felling of their mature woodland on our boundary. Luckily, the rain only started once we were all safely back indoors consuming our festive lunch. 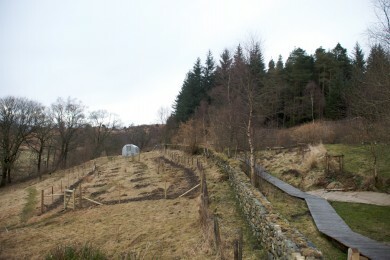 We've added a new web bit about our new orchard here. 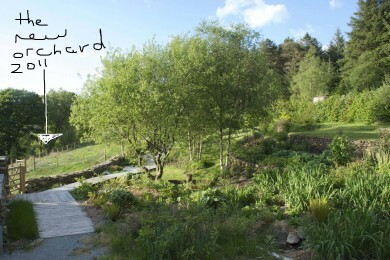 Alistair did a nice new site map for the NGS day, featuring a sketch of the "Future Orchard" at the top of our Wildflower Meadow. This is currently just a mown stock-fenced paddock with 24 blobs of mulch set at regular intervals where this coming winter we will plant some very young fruit 'maidens' (as young grafted apple plants are known). As with all good childcare we'll then ignore them for the best part of a decade - before (we hope) realising they have turned out rather well and enjoying the fruits of our labours. For now - like all fanatical gardeners I am already working on next year - I am sourcing the 24 trees, 6 of the most altitude, wind and rain-proof varieties from England, Scotland, Wales and Ireland. From Irish Seed Savers I'll be ordering 'Yellow Pitcher', 'April Queen', 'Cavan Sugar Cane', 'Kemp' and 'Keegan's Crab' which apparently isn't a crab. Finally, Wales will be represented by 'Cissy', 'Bardsey', 'St Cecilia', 'Pig Aderyn', 'Croen Mochyn' and a 'Snowdon Queen' pear - yes a pear, found at 1000' on the slopes of Snowdon!